Realm Royale’s latest DLC is letting you get shinier than ever with the Gold Plated Prowler Bundle. For £15.99, not only will you add another 1,000 Crowns to your name – and account – but you’ll also get the SHIN3YTR0N mount. And no, I don’t condone spelling Shiny like that. However, it is a pretty gorgeous looking golden beast, that will put most mounts in World of Warcraft to shame. The cybernetic feline can traverse the battlefield with ease, looking stylish and gleaming all the way. 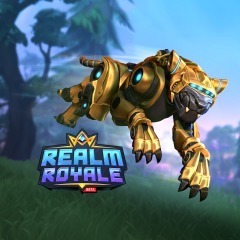 Whats more, the Crowns can be spent on character skins, mounts or whatever else you want at the Realm Royale shop. Considering these Crowns normally set you back £7.99, you’re basically paying that extra £7 for a shiny mount as well, as opposed to another 1,200 Crowns. So it’s all up to you what you value in game.